The Friends of Westerly Library and Wilcox Park have been the fundraising and volunteering champions since 1972. They sponsor special programs on art, history, music, and readings by renowned authors. In 2005, they established the Friends Endowment Fund with the interest going towards the operating costs of the Library and Park. New Year’s Day 2019 marks the beginning of the 350th anniversary of Westerly, and many exciting events are being planned. On January 1 there will be a Unity Bell Ringing as 30 bells throughout our town will peal from noon to 12:01. Be sure to take a moment to enjoy the joyous sounds either at home or with a happy crowd at one of the many locations throughout Westerly (www.westerly350.com). All are invited to bring their favorite bell to add to the merry din. 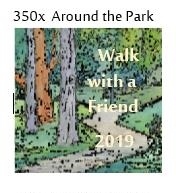 Also at that time, the Friends of Westerly Library and Wilcox Park will be at the esplanade (directly across from Town Hall) to launch 350x Around the Park, an invitation for people and their dogs to walk around the park. Recording sheets and special collectible buttons will be distributed. Forms to print are available here. If you print out your own, be sure to stop by at the library and sign up to register in the white binder on the Circulation counter. Each time a person walks around the park, he records the date on a line. If four laps are completed that day, four lines will be filled. Each form has 50 lines. Completed forms will be handed in at the Circulation Desk at the Library. New forms will be available in a white binder found there. A poster hanging in the library will track the progress walkers are making. How far is it around the park? 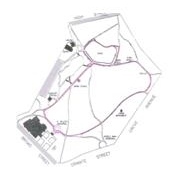 One lap around the main path is less than a half mile, but if one goes around the far side of the pond, the distance is one-half mile. Either a short lap or a long lap counts as one time around the park. The park is open from dawn to 9pm every day. A study published in 2014 (Environment and Behavior) has shown that looking at trees can significantly reduce stress levels, and it is common knowledge that seeing a smiling face and exchanging greetings brightens even the grayest wintery day. Join in the fun and walk with your friends. Email westerlylibraryfriends44@gmail.com with any questions. 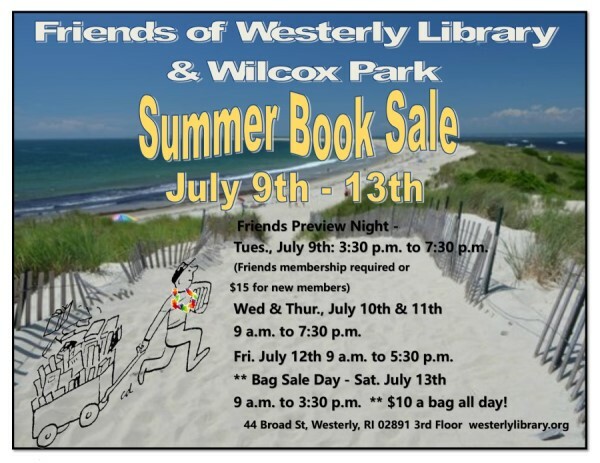 The Friends of Westerly Library and Wilcox Park are best known for the book sales they hold to benefit the library. Currently they are held in the summer and winter. All proceeds from the sales go towards the purchase of new materials for the Library. Donated books are accepted at any time; please drop off donations at the Circulation Desk. If you would like to volunteer to help at our book sales, please leave your name and phone number at the Circulation Desk. It will begin Tuesday afternoon at 3:30, July 9th for Friends and will be open to everyone on the 10th through Saturday, July 13th. Looking forward to seeing you there! To join the Friends of the Library, please use the attached form. The Friends of the Westerly Memorial Library and Wilcox Park periodically post below donated books for sale. We list books of local interest, rare books and unique books. All purchases requiring shipping will be sent media mail. Please contact us about with any questions regarding the books themselves or shipping and handling costs: Debra Howson: debrahowson@yahoo.com or Margy Long: margylong@gmail.com. Please see attachment below for the list of books.